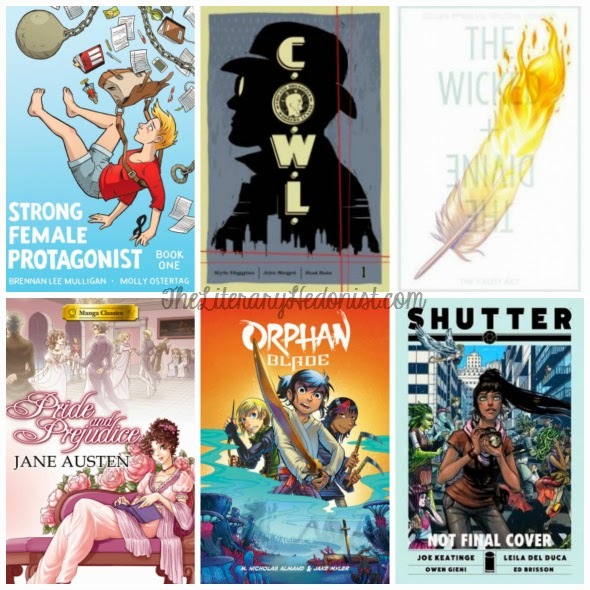 Don't judge me, but I may have downloaded even more graphic novels off of NetGalley. They are just so easily and freely acquired, I couldn't help myself. ...I said don't judge me. Thanks, Mari! I also love the original Pride and Prejudice. I think I own 3 different movie versions on dvd. The BBC really knows how to do an adaptation of a classic. Just checked out your post, Nyze. I've been hearing good things about Claudia Gray's A Thousand Pieces of You. I had so much trouble not clicking on the Strong Female Protagonist graphic noel! I hope you'll enjoy it! Have a great Sunday and a fabulous week, Rosie. I keep getting by the Humble Bundle comic deals and then forget all about them. No judging! NetGalley and I have our own issues! It's just so fun and free and next thing you know you've requested 20 books! Well, I think of it this way, I am not a fan of Graphic novels and someone needs to review them, so it might as well be you...lol. I am no judge of the clicking on netgalley cause I have that addiction myself and each week I tell myself NO but if you check out mine you will see it didn't work this week either..lol. hahaha Stormi, I will gladly take one for the team and download all the graphic novels! Hey Vicky! Yeah, I love graphic novels. They're like comic books for adults, and the ones that are really well done pack a strong punch. Edelweiss got some great GN too, have you checked it?